Learn more about Decatur Click this Link! "Even before making the decision to move in, the other residents were introducing themselves and making us feel at home. That closed the deal for us moving in. You just don't find neighbors like that anymore." "I have been here only a few months and it seems very nice, laid back kind of place." "..enjoy living at NDG. The neighbors are friendly and the atmosphere is quiet is quiet and peaceful. The management is responsive and repairs are done within 3-5 days of request." 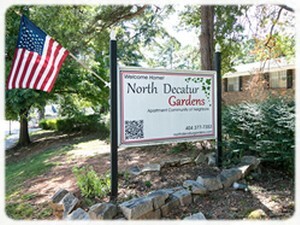 ".. have lived at North Decatur Gardens since the Spring of 2007 and my stay has been most pleasant. My two-bedroom apartment was spacious and very inviting with its hardwood flooring throughout..."
Welcome to North Decatur Gardens! We respond promptly to all email, so feel free to email us with any non-emergency maintenance or office correspondence. *Remember, emergencies must be called in with a follow up written request. Complaints can be emailed and I will put your request on the pest control list and they will take care of it when they're here or if needed sooner let me know and I will put in a special request.